Use a start-up script to overcome limitations of Motion/FFmpeg and save multiple Raspberry Pi dashboard camera timelapse videos and images, automatically. In my last post, Raspberry Pi-Powered Dashboard Video Camera Using Motion and FFmpeg, I demonstrated how the Raspberry Pi can be used as a low-cost dashboard video camera. One of the challenges I faced in that post was how to save the timelapse videos and individual images (frames) created by Motion and FFmpeg when the Raspberry Pi is turned on and off. 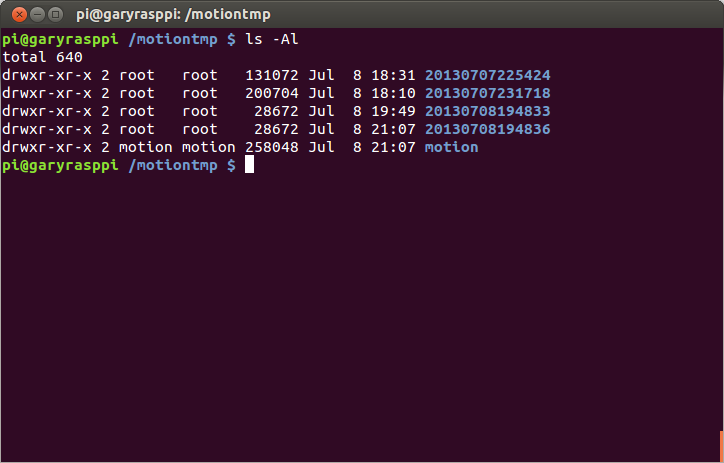 Each time the car starts, the Raspberry Pi boots up, and Motion begins to run, the previous images and video, stored in the default ‘/tmp/motion/’ directory are removed and new images and video, created. Take the average daily commute, we drive to and from work. Maybe we stop for a morning coffee, or stop at the store on the way home to pick up dinner. Maybe we use our car go out for lunch. Our car starts, stops, starts, stops, starts, and stops. 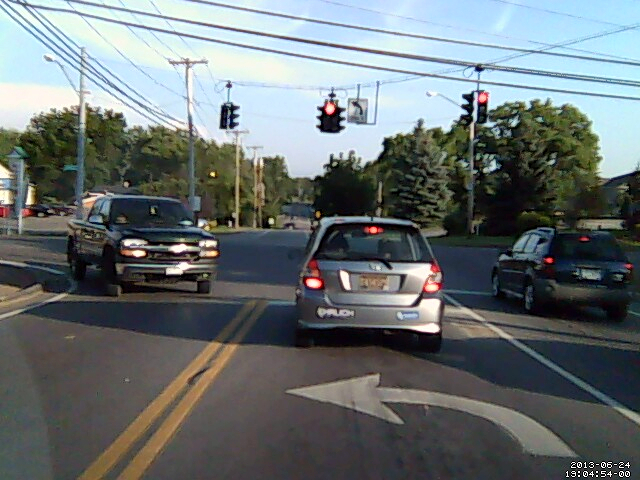 Our daily commute actually encompasses a series small trips, and therefore multiple dash-cam timelapse videos. If you are only interested in keeping the latest timelapse video in case of an accident, then this may not be a problem. When the accident occurs, simply pull the SDHC card from the Raspberry Pi and copy the video and images off to your laptop. However, if you are interested in capturing and preserving series of dash-cam videos, such as in the daily commute example above, then the default behavior of Motion is insufficient. To preserve each video segment or series of images, we need a way to preserve the content created by Motion and FFmpeg, before they are overwritten. In this post, I will present a solution to overcome this limitation. Sounds pretty simple. However, understanding how startup scripts work with Debian’s Init program, making sure the new move script run before Motion starts, and knowing how to move a huge number of files, all required forethought. Change the following setting (in bold below). Note when Motion starts for the first time, it will create the ‘motion’ sub folder inside ‘motiontmp’. You do not have to create it yourself. 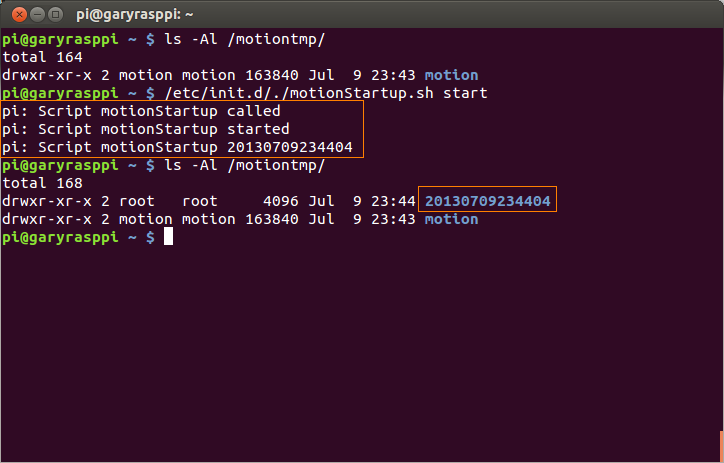 Next, create the new shell script that will run at startup to move Motion’s video and images. The script creates a timestamped folder in new ‘motiontmp’ directory for each series of images and video. The script then copies all files from the ‘motion’ directory to the new timestamped directory. Before copying, the script deletes any zero-byte jpegs, which are images that did not fully process prior to the Raspberry Pi being shut off when the car stopped. To create the new script, run the following command. Copy the following contents into the script and save it. # Short-Description: Move motion files at startup. # Description:       Move motion files at startup. 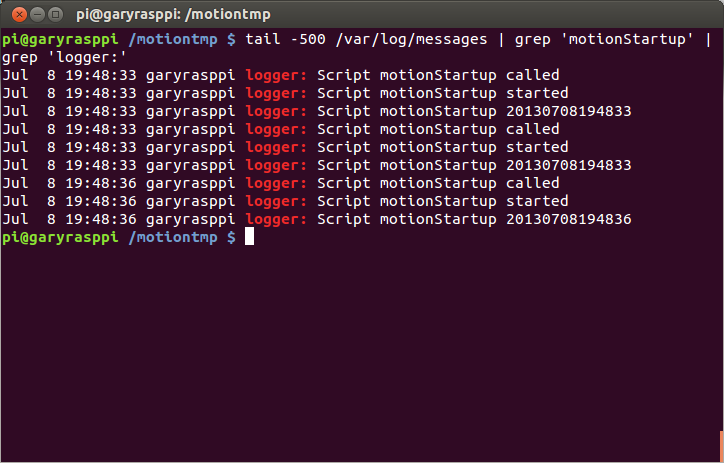 logger -s "Script motionStartup called"
logger -s "Script motionStartup started"
logger -s "Script motionStartup $TIMESTAMP"
sudo mkdir /motiontmp/$TIMESTAMP || logger -s "Error mkdir start"
logger -s "Script motionStartup stopped"
It’s not as simple as using ‘mv *. *’ when you have a few thousand files. This will likely throw a ‘Argument list too long’ exception. According to one stackoverflow, the exception is because bash actually expands the asterisk to every matching file, producing a very long command line. Using the ‘find’ combined with ‘xargs’ gets around these problem. The ‘xargs’ command splits up the list and issues several commands if necessary. This issue applies to several commands, including rm, cp, and mv. You should see a series of three messages output to the screen by the script, confirming the script is working. Note the new timestamped folder created by the script, below. 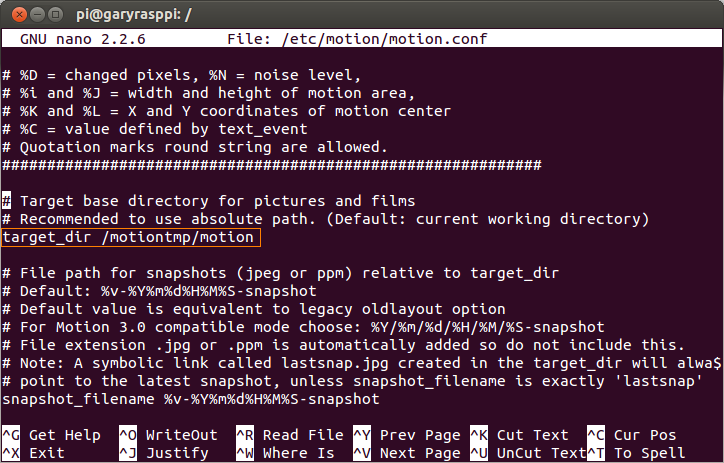 Below, is an example of the how the directory structure should look after a few videos are created by Motion, and the Raspberry Pi cycled off and on. You need to complete the rest of the steps in this post for this to work automatically. I know, the name of the post clearly says ‘Startup Script’. Well, a little tip, if you copy the code from the ‘start’ method and paste it in the ‘stop’ method, this now also works at shutdown. If you do a proper shutdown (like ‘sudo reboot’), the Raspberry Pi’s OS will call the script’s ‘stop’ method. The ‘start’ method is more useful to use for us in the car, where we may not be able to do a proper shutdown; we just turn the car off and kill power to the Pi. However, if you are shutting down from mobile device via ssh, or using a micro keyboard and LCD monitor, the script will do it’s work on the way down. Look for the new script listed under the appropriate runlevel(s). The new script should be listed before ‘motion’, as shown below. If for any reason you need to uninstall the new script (not delete/remove), run the following command. This not a common task, but necessary to change the order of execution of the scripts or rename a script. Once the startup script is working and we are capturing images and timelapse video, the next thing we will probably want to do is copy files off the Raspberry Pi. To do this over your WiFi network, use a ‘scp’ command from a remote machine. The below script copies all directories, stating with ‘2013’, and their contents to remote machine, preserving the directory structure. Maybe you just want all the timelapse videos Motion/FFmpeg creates; you don’t care about the images. The following command copies just the MPEG videos from all ‘2013’ folders to a single directory on the your remote machine. The directory structure is ignored during the copy. This is the quickest way to just store all the videos. To remove all the videos and images once they have been moved off the Pi and are no longer needed, you can run a rm command. Using the ‘-rf’ options make sure the directories and their contents are removed. The only issue I have yet to overcome is maintaining the current time on the Raspberry Pi. The Pi lacks a Real Time Clock (RTC). Therefore, turning the Pi on and off in the car causes it to loose the current time. Since the Pi is not always on a WiFi network, it can’t sync to the current time when restarted. The only side-effects I’ve seen so far caused by this, the videos occasionally contain more than one driving event and the time displayed in the videos is not always correct. Otherwise, the process works pretty well. This entry was posted on July 9, 2013, 11:30 pm and is filed under Bash Scripting, Raspberry Pi, Software Development. You can follow any responses to this entry through RSS 2.0. You can leave a response, or trackback from your own site. Could we configure the script to run the above (e.g every hour) to move the files to a Network connected drive? Maybe by specifying the \\NAS IP Address\PICapture folder somewhere in the script and then delete the captured files from the original location? i did that dash board camera but everything is awesome.but thing i want record the video continuously… i am beginner for raspberry pi..